« Stacey Burns-A Cold Case? 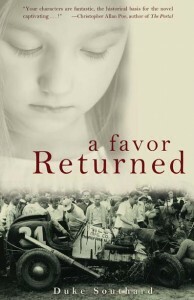 After the original version of A Favor Returned was released in May, 2000, I desperately wanted it to be reviewed by a respected source, such as, of course, the New York Times. That did not happen. I contacted an old acquaintance who happened to work in a New Jersey newspaper office and actually edited the monthly book review section of the paper. I was told that they receive so many books to review that it impossible to handle all of them so he simply places all the books he receives on a table in the office and lets his reviewers sift through them and decide which ones they want to review. A Favor Returned didn’t make that cut either. Thirteen years later, things have changed dramatically. Here is the best gift you as a reader can give to an author and it is absolutely free. The only cost involved is an small time investment. If you enjoyed A Favor Returned or Agent for Justice or The Week from Heaven and Hell, I love to hear about it, but going to Amazon.com and rating the book and writing a review would be the best compliment and even could have a dramatic effect on the popularity of the book. That would be this author’s best gift from a reader.